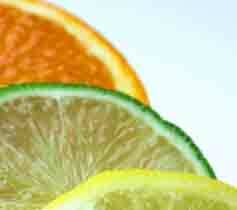 Vitamin C, also known as ascorbic acid, is a water soluble vitamin. This means that it is not stored in the body but taken regularly either through supplements (i.e. pills) or through our diet. Vitamin C can be found in citrus fruits, such as oranges and lemons, but can also be found in green vegetables and tomatoes. Because it is produced in the skin, the amount of ascorbic acid will decrease dramatically through excessive exposure to pollution or the sun. Nowadays health authorities in many countries are advocating five portions of fruit and vegetables a day as a means of combating some of the epidemics which are hitting the developed world hard, mainly since the rise of eating "fast" food, which often has little nutritional value and is high in sugar and the wrong type of fats. The 5 A DAY programs are based on advice from the World Health Organization, which advocates a daily intake of at least 400g of fruit and vegetables to decrease the risk of age-related conditions, such as obesity, high blood pressure, stroke, type 2 diabetes and heart disease. Your 5 A DAY should include a variety of fruit and vegetables to ensure that you get enough fibre, vitamins, minerals and other nutrients because different combinations of nutrients exist in different vegetables. Most fruits and vegetables contain some Vitamin C, but are also a good source of many other vitamins and minerals, including folate and potassium. The following chart shows foods which are particularly high in Vitamin C.
Vitamin C has many different functions. It is an antioxidant which helps protect various molecules from harm, such as proteins, lipids, carbohydrates, DNA and RNA. It is also needed for collagen synthesis which is a component of blood vessels, teeth, gums, tendons, ligaments and bones. It also affects our mood by maintaining the neurotransmitters which in turn affect our brain function. It is also needed for the synthesis of carnitine, which is an essential molecule that is responsible for the transportation of fats to the mitochondria. These are small organelles which produce energy which is then used in various cells throughout the body. Furthermore, it can enhance iron absorption. However, ascorbic acid is best known for supporting the immune system to prevent illness. It does this by stimulating the production and the function of white blood cells (lymphocytes and phagocytes). This vitamin is also important in enhancing phagocytosis, which is the engulfing and destruction of bacteria, cellular motility and the process of chemo taxis which controls the movement of a cell or organism toward or away from a chemical stimulus. It is very important to have a sufficient intake of ascorbic acid in order to maintain a strong and healthy immune system. Moreover, Vitamin C also has anti-aging properties as it helps repair damaged cells and prevents excessive and/or cancerous cell growth. Recent studies have also suggested that people who have a high intake of the C vitamin are less likely to have Coronary Heart Disease and Stroke. It has also been shown that in ascorbic acid can reduce the severity of Cataracts, which is a disease that results in visual impairment. The consumption of fresh fruits and vegetables has been seen as mediums of reducing the risk of developing some types of cancer. This vitamin has also been used to treat certain diseases and medical problems such as vasodilation, hypertension, increasing survival time of cancer patients, diabetes (types one and two) and the common cold. Deficiency: Vitamin C deficiency is rare in developing countries as a daily intake of 10mg is sufficient. However, deficiency can lead to scurvy which results in defective formation of the bones and poor healing of wounds. This will also lead to an increased risk of infection due to a weakened immune system. Other symptoms of deficiency may include extreme fatigue and deterioration of the gums (due to lack of collagen which is the main structural component of gums). Overdose: On the other hand, ascorbic acid overdose will have negative effects on the body’s metabolism, resulting in stomach aches and diarrhea. The best way to avoid either deficiency or overdose of this essential vitamin is to consume it in the correct dosage. It is recommended that 90 mg of this vitamin be taken in per day.